April 5 was the National Arbor Day. The season for planting trees has finally arrived. With the arrival of the spring, however, fine dust is sweeping across the country, and the public thirst for refreshing air is stronger than ever. At such a period, POSCO’s approach to creating a humble forest inside their steelworks is worth noting. A forest inside steel mills? 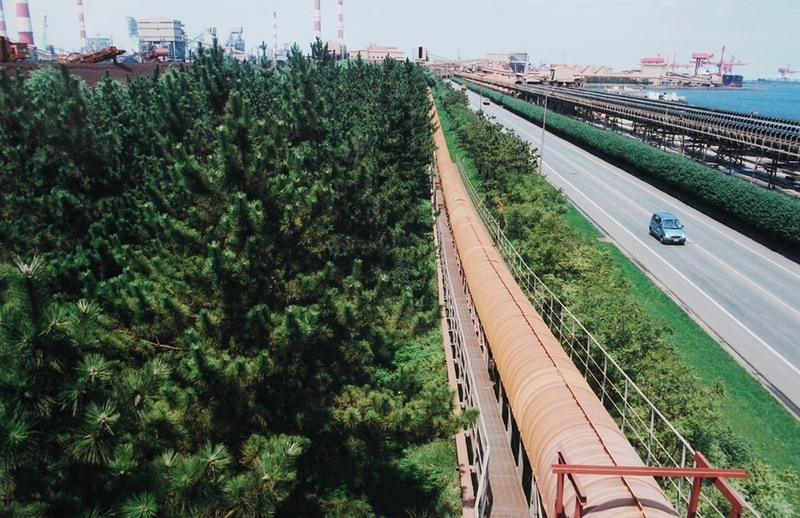 The connection between the two isn’t apparent, but POSCO is going above and beyond to maintain and expand the green space within their steel mills. Why? Pohang Steelworks stands over old landfills near a seashore – not an ideal space for planting or growing trees. This challenging circumstance, however, didn’t stop POSCO from establishing a Green Zone outside the Steelworks from the early days of its establishment, and the company’s careful management of the area continues to this day. Up until last year, Pohang Steelworks invested 44.2 billion KRW (approx. 39.9 million USD) for its afforestation project – Gwangyang Steelworks spent 28.3 billion KRW (approx. 24.87 million USD) for the same task. Through massive investment, systematic planning, and persistent management, POSCO transformed the area – first by building the steel mill in no man’s land; then by surrounding the mill with trees. Lots of trees. Now their steel mills, both Gwangyang and Pohang Steelworks, stand in the middle of forests. l 350 Central Parks Inside POSCO Steelworks? Walking around Pohang and Gwangyang Steelworks, one cannot miss the numerous evergreen trees with broad leaves. That’s because tree leaves could cause malfunctions for the steelworks facilities – with broad leaves, such occurrence is less likely. Both in and out of the steelworks, it’s obvious the company thought through various ecological details. For areas prone to arsenic acid dust, the trees were cascaded over to shield off the dust. When designing landscapes, the team also looked into the underground piping system to make sure the pipelines do not interfere with the trees’ pathways. POSCO spared no costs to green their mills – their meticulous afforestation effort was subsequently followed by equally, if not more, meticulous management. Their effort bore fruit in the form of hiked greenspace ratio. 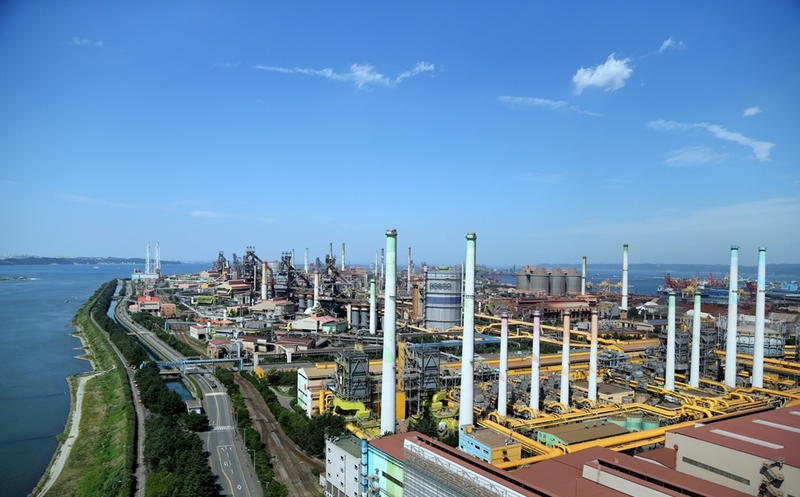 Now, the greenspace at Pohang Steelworks is about 2.2 million square meters, which is 24% of the mill’s total space of 9.5 million square meters. 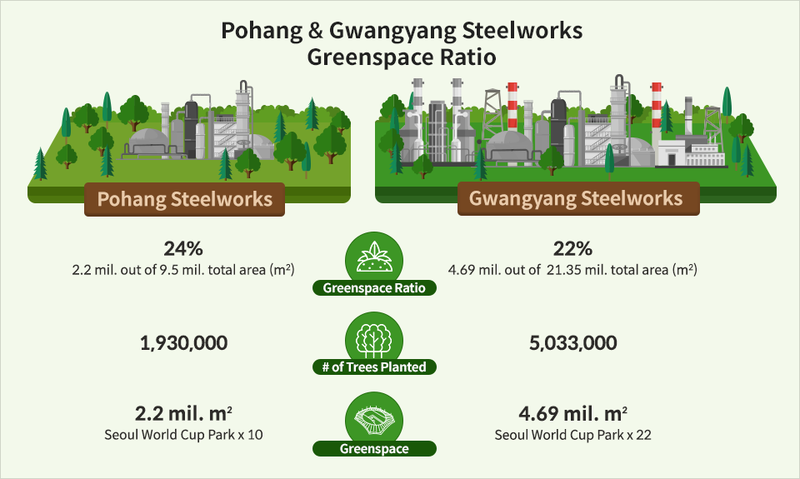 The greenery at Gwangyang Steelworks, twice the size of Pohang Steelworks, occupies 22% of its total space. Gwangyang Steelworks shares 4.69 million square meters of space with trees and forests out of its entire surface area of 21.35 million square meters. With 1.93 million trees planted and growing at Pohang Steelworks and with over 5 million at Gwangyang, altogether 7 million trees are growing in both steelworks combined. To put that in context, the Central Park in New York City has about 20,000 trees. With 7 million trees, it’s as if Pohang and Gwangyang Steelworks are holding 350 Central Parks inside the mills. POSCO’s afforestation project for their steelworks did not happen overnight, and it keeps on growing. So the greenspaces at Pohang and Gwangyang are 2.2 million and 4.69 million square meters, respectively. These numbers alone don’t give us a palpable enough picture. How big are they exactly? Using Seoul World Cup Park as a base point might be helpful. The Seoul World Cup Park is about 210, 000 square meters, which means, at 2.2 million, the greenspace at Pohang Steelworks is about ten times bigger – and Gwangyang, at 4.69 million, over 22 times. Such vast spaces require careful management. At Pohang Steelworks, Administration & Public Relations Group is in charge of the space management, together with POSCO’s partner, DongWon. From DongWon alone, over 30 workforces are committed to managing 1.93 million trees planted across the 2.2 million-square-meter space. The employees are busy pruning, trimming and getting insect pests under control. Keeping the trees clean and washed is also part of their job. Nearly five trucks are mobilized to perform the task. Dae-Hyung Lee, the Manager of Administration & Public Relations Group at Pohang Steelworks, says: “The workload can be enormous but invisible, which is why it gives us tremendous joy when people send us thank-you notes, no matter how big or small. Dae-Sun Kim, DongWon Manager, also said: “It’s gratifying to notice the improvements at the steel mills and to know, what we do matters.” Lots of employees spend time in the parks managed by these ‘gardeners’ of the little forest surrounding the steel mills. National Arbor Day or not, POSCO’s endeavor to keep the mills green never stops – POSCO’s effort to plant over 30,000 trees every year rewards both its employees and the community in the form of more green spaces. Not everyone can plant trees, but everyone can take a moment to pay gratitude to the values the trees give us. Let’s plant that seed of gratitude in our heart.